V15, an Israeli group whose goal is to "replace the government", using top Obama aid as its "secret campaign weapon". A top appointee in President Barack Obama’s 2012 election campaign is now working to defeat Prime Minister Binyamin Netanyahu in the upcoming March election in Israel, according to the Daily Caller website. According to the report, Jeremy Bird, who was the national field director for Obama’s 2012 campaign, is now working for an Israel-based group, dubbed V15, an anti-Netanyahu group that is backed by a the leftist One Voice organization. A report in Haaretz on Monday provided more information about V15, whose goal is to “replace the government” in Israel, though they are careful about specifically naming Netanyahu. “The goal is not to promote a specific candidate or party, but to put your ego aside for the greater good,” Nimrod Dweck, one of the founders of V15, told Haaretz. OneVoice is expected to merge with V15 before the March 17 election, the newspaper revealed, noting the groups have a common goal: To recruit tens of thousands of volunteers for house-to-house canvassing, knocking on anywhere between 150,000 and 1 million doors — a method that was effective in Obama’s first presidential campaign, in particular. Bird is described as the “secret campaign weapon” for V15. Bird was the field director for South Carolina in Obama’s primary campaign for the 2008 election. Early opinion polls in the state gave Obama and Hillary Clinton equal odds, but in the primary vote Obama beat her two to one. That victory helped Obama to clinch the Democratic nomination, and it resulted in Bird’s promotion to deputy national field director for the 2008 national election. For Obama’s 2012 reelection campaign, Bird was national field director. After the election, Bird parlayed his success into 270 Strategies, a political consulting firm that helps election campaigns all over the world to build grassroots strategies. “It’s not right to do in Israel exactly what we did in the United States, the context is completely different,” he told Haaretz. Israel is an ideal country for a door-knocking campaign because of its relatively small size, Bird said, adding that Israel has very complex politics, a large number of parties and relatively high voter turnout, and it is possible to speak with enough people here to replace the government. Lynda Tran, who co-founded Bird’s campaign firm, 270 Strategies, confirmed to the Daily Caller that “we are working with OneVoice” but declined to discuss the details of Bird’s anti-Netayanhu effort. “The bottom line here is we believe grassroots organizing is powerful, that empowering people to get involved their elections is good for democracy, and we are working with clients who feel the same way,” she added. The Daily Caller noted, however, that there’s little or no chance that Bird would work against Netanyahu if Obama didn’t want Netanyahu defeated in the March election. If Bird was working against Obama’s wishes, it would threaten the future of his firm — and of his fellow employees — because Obama has such sway within the Democratic party’s internal economic marketplace for election and polling services, the report noted. 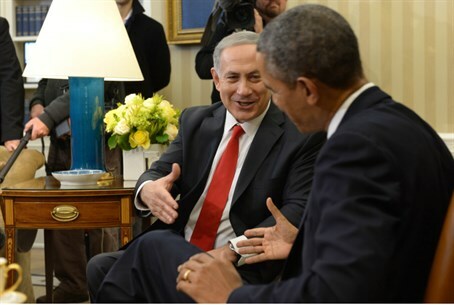 While the relationship between Netanyahu and Obama has been tense throughout their time in office, this report comes as tensions are in the air once again, this time over Netanyahu’s acceptance of an invitation to address Congress weeks before the Israeli election. Netanyahu’s speech to Congress was met with a cold response from the White House, which said it was contrary to protocol. The White House later indicated that neither Obama nor Secretary of State John Kerry would meet with Netanyahu while he is in Washington. The Daily Caller cited an unnamed American official who told an Israeli newspaper that Netanyahu’s acceptance of the invitation was an insult to Obama. “We thought we’ve seen everything,” said the official. Bird, according to the report, echoed that comment in a January 22 tweet, where he suggested that the GOP and Sheldon Adelson, the American philanthropist known for his close friendship with Netanyahu, are trying to help Netanyahu win the March election. “What do you think Adelson promised GOP in exchange for this insane BiBi House visit? Blatant attempt to bolster Israeli PM before elections,” the tweet read.